I am a big fan of mushrooms and I am always on the lookout for new ways to enjoy them. One mushroom that I do not seem to use that often if a fairly common one, the portobello or portabella mushroom. Sure I’ve done stuffed portabella mushrooms and I’ve done portobello mushroom sandwiches but that seems to be about it. When I came across the idea of a roasted portabella salad on eat me, delicious I immediatly jumped at the chance to try using portobello mushrooms in a new way. This roasted portobello mushroom salad is pretty much like a chicken salad where it is a salad with a sliced roasted portobello mushroom on top. 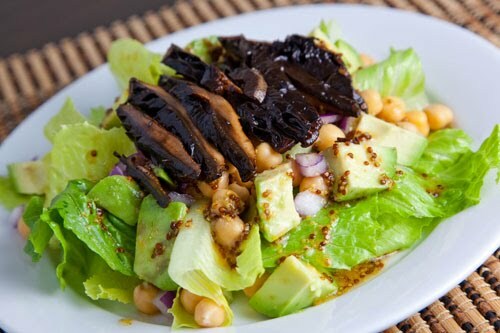 The mushroom is marinated in a tasty balsamic vinegar, soy sauce and garlic marinade and then roasted to perfection before being added to the salad. Despite the fact that it takes a bit of time to marinate and roast the mushrooms, this salad is pretty easy to make. In fact you could easily marinate and roast the mushrooms a day or so ahead of time and all that is left is to assemble the salad. For the dressing, I went with a grainy mustard version of a honey dijon vinaigrette as I have been into grainy mustards lately. The roasted portobello mushroom salad with honey dijon dressing turned out really well! The mushrooms were nice and tender and they had soaked up all of the wonderful flavours of the marinade. I really liked the creamy avocado and chickpea combo in the salad and the dressing was a nice combination of sweet, sour, hot, tangy and the whole grin mustard added a texture to everything. The portobello mushrooms worked really well in the salad and I look forward to trying more salads with them! Marinate the mushrooms in the vinegar, soy sauce and garlic for 20 minutes. Place the mushrooms and the marinade in a baking dish and cover with aluminum foil. Bake in a preheated 400F/200C oven for 30 minutes. Flip the mushrooms and bake uncovered for 10 minutes. Kevin I have to start cooking more with Portobello mushrooms. I love them so much. That plate is looking good. Oh my heck! That looks SO delicious. I'm a huge fan of Portobello mushrooms, so I'm definitely going to have to try this recipe out…as a sidenote…your pictures are awesome! Oh, I love portobellos. Looks delish! Eclectic salad! I would never have paired mushrooms and avocado – not sure why! A great salad! I love the flavor of those mushrooms! I tried portabellos for the first time a few weeks ago and really liked them. This marinade sounds great, as do your salad mix-ins! I maintained a meatless diet for about 10 years and ate A LOT of Portobellos, especially grilled. But never had anything like this. Looks yummy. That looks great! I love the earthyness of portabellos and roasting them seems to bring out the woodsy flavour even more! Great idea!! Congrats on being featured in Daily Candy Everywhere Weekend Guide!! Huge deal! Congrats on Daily Candy! Major! Congrats on the Daily Candy spot!! I've been following your blog forever, I am so glad for you, you deserve the recognition!!! Yay for you! Yes…congrats on the Daily Candy piece which is how I found you. I've just briefly been paging through the blog and I have to tell you it's one of the most straightforward, easy-to-use, exciting-looking food blogs I've seen in awhile. It's simple – in the very best definition of the word. And there are tons of recipes I see that I MUST try. What a tasty and beautiful salad Kevin. awesome blog–glad I found it! i LOVE portabellos, what a delicious salad! I'm a big fan of mushrooms too! These mushrooms look amazing! yummy flavours. Looks like a great salad. What a great idea. I love grilled/roasted portobellos, but have never used them on a salad. I know you posted this years ago, but I have to say that this is a terrific recipe, far better than the salmon dish I made with it. I used the marinade and roasting instructions to make a similar salad. This was by far the most delicious portobello mushroom I've eaten. This is will be a recipe that I use often. Thank you!